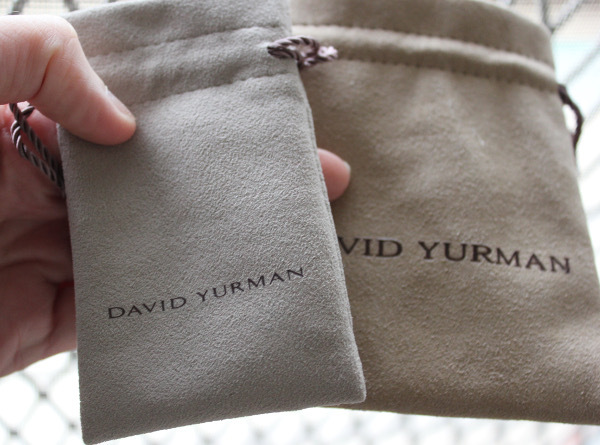 I browse websites like The Real Real pretty often looking for specific David Yurman jewelry that I've wanted to add to my collection. I was lucky enough to get a great price on a bracelet from The Real Real and had such a good experience with that company that I've started browsing other sites. 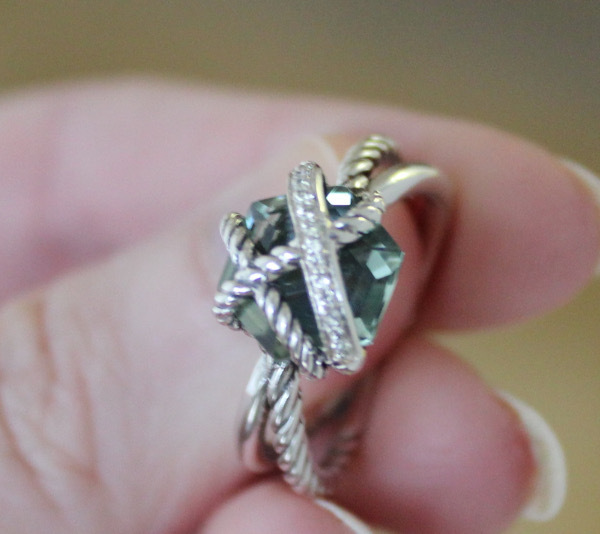 A few months ago I was perusing Poshmark when I came across the below Cable Wrap Ring. It was listed for a great price and I made an even lower offer which was accepted. The user I purchased from only sold DY jewelry (and a lot of it - which was admittedly suspect) but with the Poshmark guarantee of authenticity or your money back, I decided to try it. Unfortunately, the ring was definitely a fake, but I did get my money back from Poshmark. I wanted to do a review on the company because I was pleased with the customer service, but also take the opportunity to show the features of the ring and the accompanying pouch which made me 100% sure the ring was fake. Read on for my experience and the things that made the ring noticeably fake - even though it was honestly a pretty good fake! 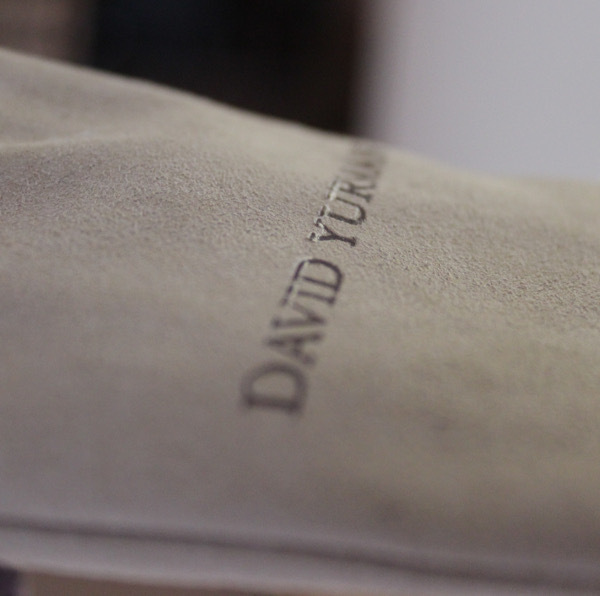 But then I took a look at the David Yurman stamp on the underside of the ring and I immediately thought it was suspect. As you can see below, the copyright mark and the 5 of the 925 symbol are hardly stamped at all. When I compared this stamp to my other DY jewelry, it became even more suspicious. Real DY jewelry will have a strong, clear stamp. The below stamp looks shoddy. You can also see some nicks in the metal on the underside. 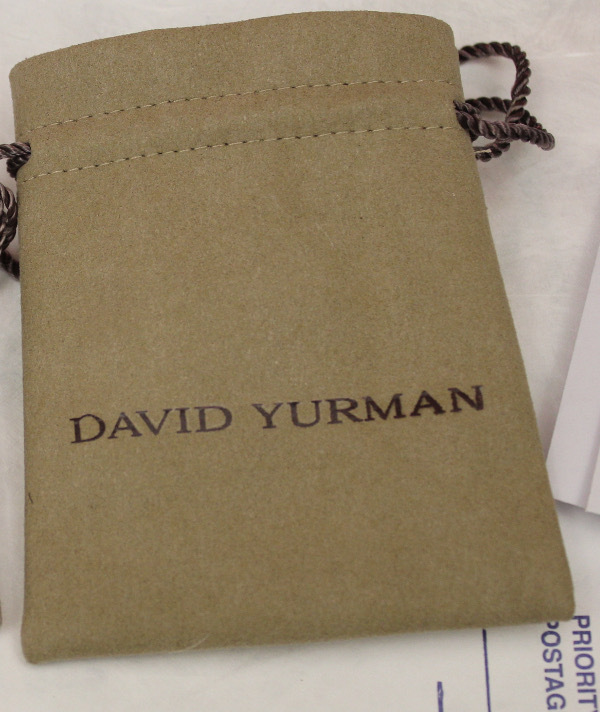 DY jewelry is known for its excellent craftsmanship - these nicks wouldn't be present on real DY jewelry. To make 100% sure that the ring was fake, I drove over to the mall and went to Neiman Marcus. Luckily, they had the exact ring in stock and I was able to try it on (with the fake in my pocket - because they will NOT authenticate jewelry for you) and I immediately knew the ring was fake once I held the real one in my hand. 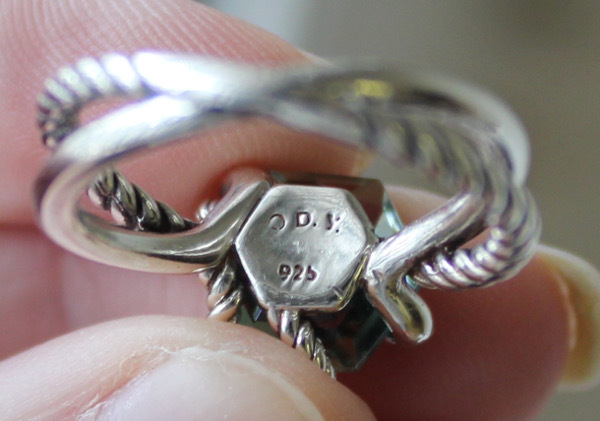 For one, the real DY ring is noticeably heavier because its solid silver, whereas the fake must have either been hollow silver or possibly another metal that looks like silver. 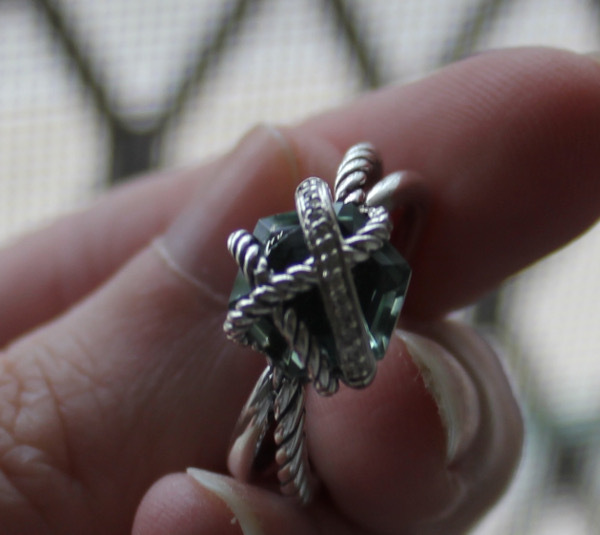 The other is that even though the fake ring seemed sparkly and shiny, the real thing was so much better. The second major issue aside from the stamp mark on the ring was the bag the seller sent me the ring in. The bag the seller sent the ring in is on the RIGHT. On the LEFT is one of my DY pouches from a ring I purchased legitimately. The colors are clearly off, first of all. Second, although you can't tell from photos alone, the bag on the right felt like canvas - very cheap. Whereas the bag on the left feels velvety soft. Lastly, the lettering on the right bag was COMING OFF. I laughed when I saw this. 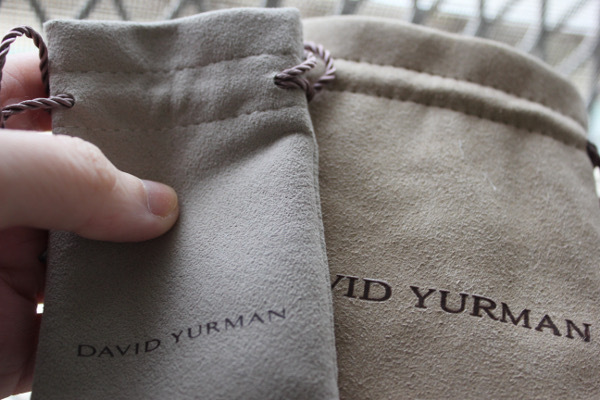 A real David Yurman pouch matches the luxury of the jewelry you're buying - the letters are not stickers that you can PEEL OFF. Above you can see how the D is peeling off. Below you can see how almost all of the letters are lifting up off the pouch - a sure sign of a fake bag. Poshmark guarantees authenticity, but you have to prove to them why they should accept a return of the item through pictures. That's why I have all these photos, because I sent a few in to Poshmark and explained why the ring and corresponding pouch were fake. Within about 24 hours someone reviewed my complaint and accepted that it was inauthentic and allowed me to return it. I was refunded my entire purchase price AND the shipping promptly. The huge problem I did have with this, however, is that you return the item TO THE SELLER! So, this girl is going to keep selling her fake David Yurman items to unsuspecting people on Poshmark! I think that's horrible. But, all I can do is try to help others from wasting their hard earned money on fake items by showing some of the things to look for to spot a fake. I hope this post was informative - I won't write off Poshmark completely, but I will definitely be wary of purchasing expensive items from sellers. The only downside to Poshmark is that no one at the company is truly authenticating the items you are buying. Whereas at The Real Real, for example, the company authenticates the items before they are placed for sale.